So, once again: Happy Spring! I know this isn’t the way a lot of you want to begin spring, but hopefully it will get a lot better for you ALL soon. Seeing that those of you in the northeast are in the midst of snow (again!) takes me back to when I went to college in Iowa. Brrr! My computer monitor conked out yesterday, which, as you would guess, was a hassle. I always get my husband’s or son’s hand-me-down computer components, so I now have my husband’s mammoth-size monitor. (He ordered a new one for himself.) I actually have had to move my new monitor over toward the wall so I can still keep an eye on my birds outside. We now have a Cardinal pair who are making our Goldfinch feeder their choice of feeding places. I’m really enjoying them >>> probably a whole lot more than the tiny Goldfinches are enjoying their company! 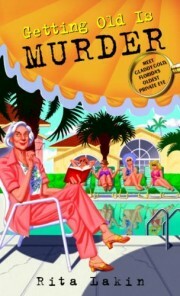 I just started a book by one of my very favorite Cozy Mystery authors: Rita Lakin. There hasn’t been a Gladdy Gold mystery since 2011, so I am really spacing out the books. I don’t want the series to end! This is a Senior Sleuth series, but in reality, it’s a senior sleuthS series! Gladdy lives in a Florida retirement community, and she is helped by a few other ladies who live there. Don’t be put off thinking these ladies take things easy! These ladies are active! These book titles should give you an idea of the series: Getting Old Is Murder, Getting Old Is Criminal, Getting Old Is to Die For, and Getting Old Can Kill You. How can you go wrong with titles like these?!? 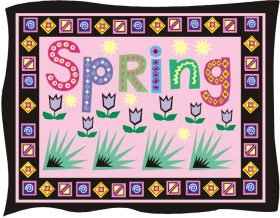 Happy Spring Danna and to the other cozy mystery readers who are experiencing it at this moment. Right now in Connecticut (coastline) it is snowing. Looking forward to Spring whenever it starts here. Soon I hope. Spring well on the way here in the U.K. and an eclipse of the sun yesterday – it’s all happening! Anne, yesterday was a big day in the U.K.! We weren’t able to see it over here in Texas. a best wishes with the computer juggling. Tessa, we’ve got our computers back in working condition. My husband’s monitor came 24 hours early, so we didn’t have to share for long. Judy, she is actually in my next “batch” of Cozy Mystery authors to get posted to the site. We had warm weather here today..in the 70’s. Have a great weekend! Melissa, I really like it. While Gladdy is the main sleuth, she definitely works with her sister and friends. I feel sort of guilty about having this spring-like weather while people in the northeast are still experiencing winter. However I see that Spring will be with them (hopefully) in a week or so. Spring here in Northern California and our favorite UPick strawberry farm is open. I really enjoyed Rita Lakin’s books Always wonder why they ended. Ruth N, I haven’t been to a UPick farm in years. What fun! i have all her books, i wish there were more. Marilyn, Rita Lakin was a writer, producer, and editor for shows like Peyton Place back in the 1960s, Mod Squad back in the late 1960s/early 1970s, Dynasty back in the 1980s, and Flamingo Road in 1980. Love Gladdy Gold & sooo wish there were more of her books. Barring that, wouldn’t mind having her for a next door neighbor & enjoying her adventures up close. Stash, yikes! With what is happening out there in the northeast, your daughter may be getting married while there’s snow on the ground! Tell me about it! Just talked the groom down from the outdoor ceremony he had his heart set on!!!! Stash, ot sounds like you are playing the role of the mother of the bride to perfection! And a very happy Spring to you too! Mimi, I’m sorry to have gotten you all excited about a new Gladdy Gold mystery! I would have been pretty excited, too! I love these books. Rita Lakin writes fun and interesting books. Her characters are a kick. I am looking forward to reading this book. Thank you. Melody, you’re so right: Rita Lakin’s characters are a kick! I’ve read all of the Gladdy Gold mysteries. Loved them!. Maybe we should start a campaign for Rita Lakin to bring Gladdy and her crew back. We want more!!! Read them all & miss Goldy?